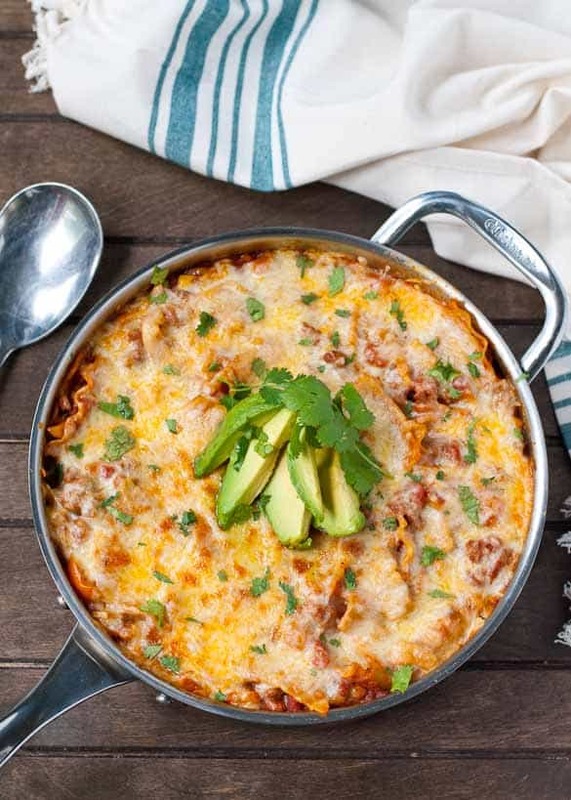 This comforting Cheesy Enchilada Skillet Lasagna comes together in a single skillet and is packed with veggies and Tex-Mex flavor. Way back in the day when the Mr. and I were newlyweds inhabiting a 900 square foot apartment with the narrowest galley kitchen you’ve ever seen, I made my first skillet lasagna. Making a regular lasagna in that tiny kitchen would have tried my patience, my dish washing abilities, and my marital communication skills. But lasagna made with just a single skillet, a lone cutting board, and 45 minutes? That I could do. My kitchen has doubled in size since those early days, but that doesn’t stop me from making skillet lasagna on a regular basis. It’s such a quick, satisfying dinner, and hey, just because I have a bigger sink these days doesn’t mean I want to use it. Believe it or not, the one-skillet, hands-off aspect of this dish isn’t even the best part. The best part is how versatile is. This dish is begging to be changed up. It screams for different cheeses, shouts for new veggies, pleads for ethnic flair. 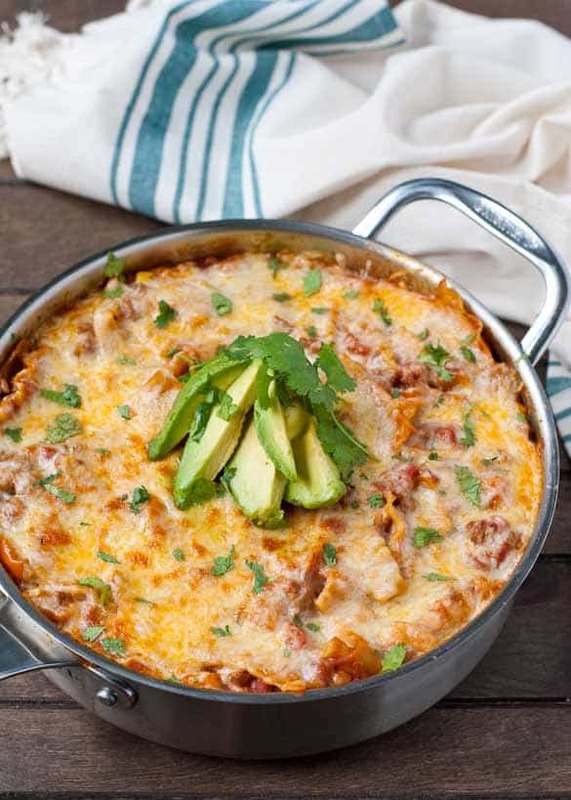 And so this Tex Mex Skillet Lasagna was born. For some reason, my craving for Mexican food increases exponentially in the summer time. Maybe it’s the availability of all the fresh veggies, or the leafy cilantro overflowing from my herb garden, but come June I’m wanting ALL THE SPICY FOODS. This lasagna delivers a one two punch of spicy flavor and healthy, fresh ingredients. It’s packed with bell peppers, tomatoes, jalapeno, and corn, and finished with diced avocado and cilantro. All of the veggies find their home amidst the warm heat of enchilada sauce, a bit of shredded cheese, and lasagna noodles. I find sneaking veggies into pasta dishes is one of the safest ways to slip them past the detecting eyes of your pickiest eaters. After all, who can resist a cheesy, saucy pasta dish? No one needs to know it happens to be chock full of fresh veggies. Another way you can healthify a pasta dish like this? Sub the ground beef for ground turkey. It’s an easy swap that cuts the fat and leaves no one the wiser. You can also sub whole wheat pasta for white to up the fiber, protein, and nutrients in your favorite comforting pasta dishes. Before you know it, you’ve transformed the ultimate comfort food, lasagna, into a no fuss, single skillet, healthy Sunday Supper. That’s a win for your schedule, your body, and most importantly, your new summer manicure. Heat oil in a very large saute pan over medium heat. Add onion, bell pepper, and jalapeno. Cook until starting to soften, about 5 minutes. Add ground turkey and cook until no longer pink. Stir in the corn then season the mixture with cumin, chili powder, oregano, and salt. Scatter pasta onto meat but do not stir. Pour diced tomatoes with juice and enchilada sauce over pasta. Cover and bring to simmer. Reduce heat to medium low and simmer, stirring occasionally, until pasta is tender, about 20-25 minutes. Allow the mixture to simmer uncovered for the final five minutes. Remove from heat and sprinkle with cheese. Allow the mixture to stand uncovered for 10 minutes or until cheese is melted and mixture is thickened. If desired, you can throw it under the broiler for a few minutes to brown on top. Serve with fresh avocado slices and cilantro. I’m holding out my plate so you can put that big scoop of lasagna on it… I’ll take an extra helping please and thank you. This is sooo cheesy and good. I wouldn’t even need any meat at all! I’m getting out my skillet this week. That’s so true Marjory! You could definitely make this a meatless meal. Nice! It’s a lot easier to convince my hubby to do dishes when there’s only one pot. That’s for sure! Who can resist this cheesey goodness? I have no idea – certainly not me! This looks amazing. My 4 year old would just dive into that skillet! What a great dish! 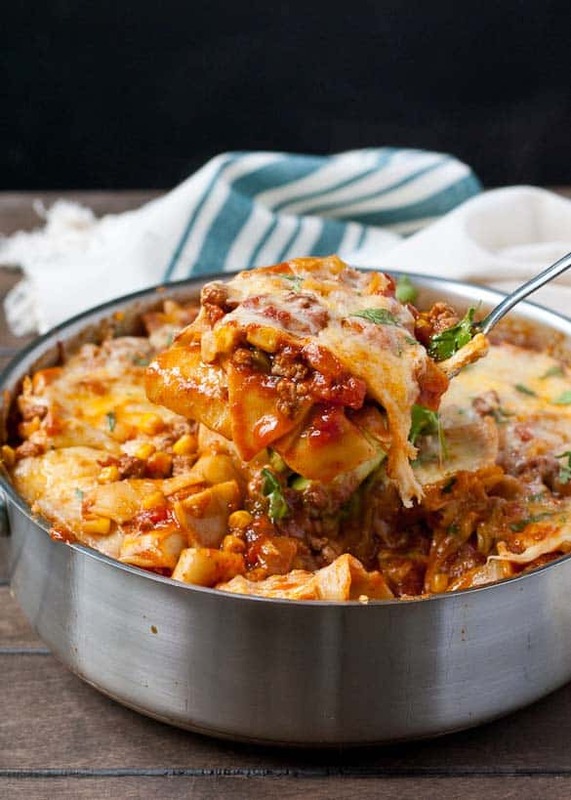 I love the flavors in this lasagna twist. Yum! I love the flavor twist on this!! Yummy!!! Love the idea of sneaking veggies in pasta dish — perfect for kids!! Yummy…this totally my kind of lasagna!!! 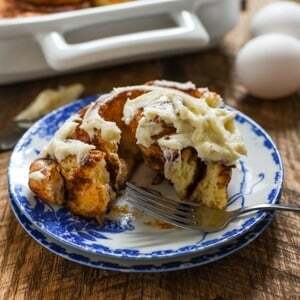 This is THE perfect idea – love everything about this dish! Yummy! How clever and simple! I could eat Mexican every day. Skillet meals are the best! 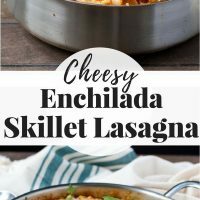 I love skillet meals, so simple and easy, plus yours looks just delicious! Yum!! 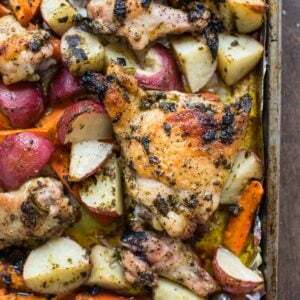 I’m totally swooning over this skillet full of deliciousness. Your pictures are gorgeous. Pinned. Thanks Jennie! I’ve been trying to capture a cheesy scoop shot for awhile. This is the closest I’ve gotten! I. Want. This. Right. NOW! Wow….this is perfection in a skillet! YUM! Beautiful photos too! 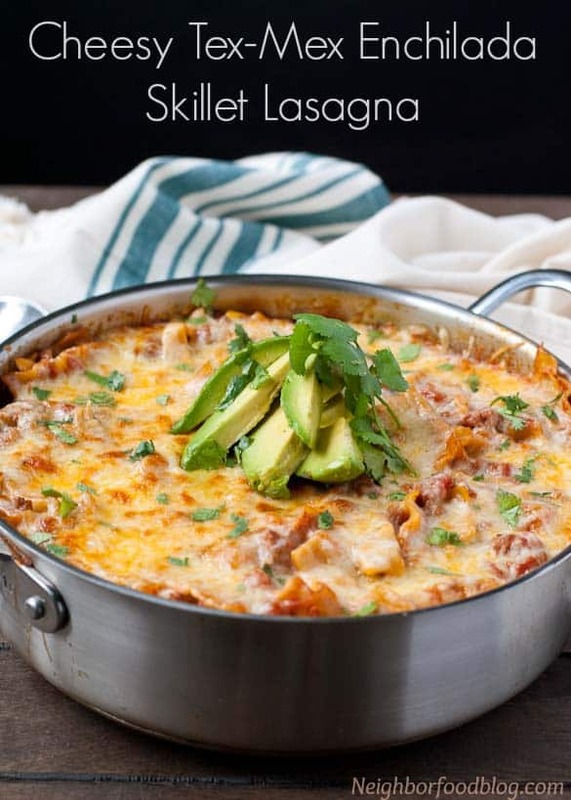 Skillet lasagna is my new favorite discovery! I’ve just been making it the normal lasagna way, but i think it definitely needs to get tex-mex-ed up! Isn’t it the best? I love anything that can be made in a single skillet. I love that you used corn and ground turkey in this. It looks amazing! This is totally going on one of my upcoming dinner plans! Awesome! I hope you guys love it! Yes! Just everything about this. 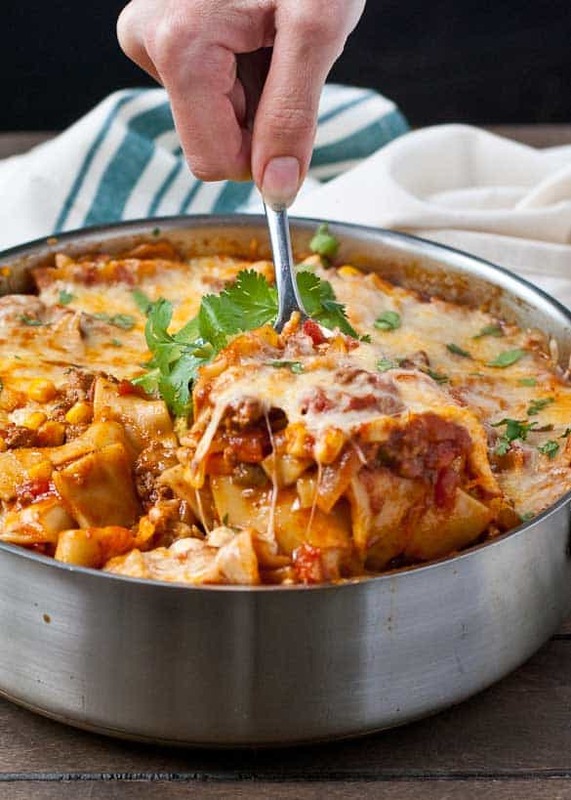 I’ve done skillet lasagna before but cheated with ravioli but I love your way too! Mmm…I definitely need to try skillet ravioli too! I like this idea, but I will substitute tortillas sautéed in hot oil instead of the noodles. After making it the first time I will play around with variations. GREAT IDEA! I think it will also be comforting in the cold season. The tortillas are a great idea! I’m sure you’ll come up with some great variations. Just had this for dinner and it was delicious! The husband scarfed it down. Didn’t change a thing about it other than I used ground beef instead of turkey because that is what I had on hand. I loved that it was all made in one pot. I will definitely be making this recipe again! Thanks. I’m so glad you enjoyed it! Thanks for taking the time to come back and let me know. It makes my day! I used Boca crumbles, and it turned out amazing! Thanks for the filling and easy recipe! I’m so glad you enjoyed this! Thanks for coming back to let me know! I’ve got to try this. It sounds wonderful. The other variations mentioned sound as wonderful. These web sites are jus great.